Crash Tested Dog Car Harness - SIMPLE TO USE FOR EVERY RIDE! The Drive Harness from EzyDog is a the Simplest to Use car safety harness for your dog. Once the original custom sizing is completed, this harness can be stepped into by your dog and latched shut within just a few short seconds! Check out the short video below to see how EZY it is to use the DRIVE. Safety First! This car safety harness conforms to and has passed all relevant requirements for the following standards: USA (FMVSS 213) Europe (ECE Regulation 16) Australia (ADR42/04). Learn more about our safety testing here. Simply feed the seat belt through both webbing handles on the top of the harness, click the buckle into the seat belt of your car and you're ready for the Drive. SIMPLE FIT! GET ON THE ROAD FAST! You only have to fit the harness to your dog once (see 'Fitting Instructions tab for Instructions) From then on, the Harness can be taken on/off very quickly using the Mag-Lok™ Instant Fit closure system. We have used only the strongest and high quality materials in this product. The Tri-Glides are made from Aluminum Alloy, so they are light, durable and incredibly strong. All webbing is made from vehicle-tested seat belt webbing and the Crosslink™technology ensures that the harness is the ultimate in strength. Simply use with the car's seat belt. *Do not use with other attachments such as the Click or Car Restraint. Please Read Before Purchase: At EzyDog we make every effort to manufacture the best products to protect your pet, however there are no official standards or test requirements for Car Canine Safety products. We have chosen to base our product designs such that they conform to a combination of global child safety and vehicle interior standards. We then test our product and obtain conformance using these standards as a guide. 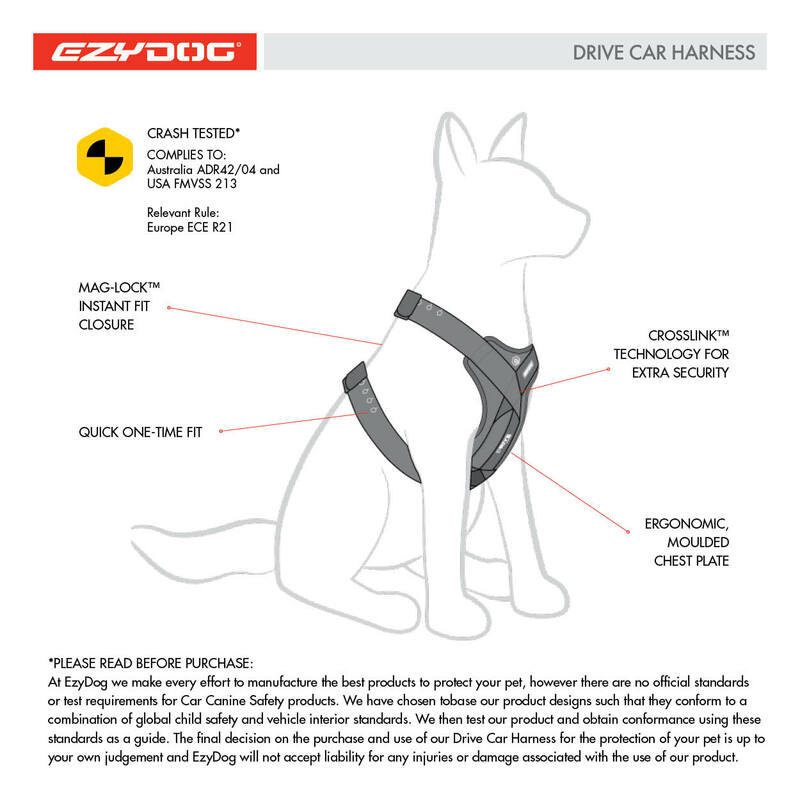 The final decision on the purchase and use of our Drive Car Harness for the protection of your pet is up to your own judgement and EzyDog will not accept liability for any injuries or damage associated with the use of our product. High quality, easy to place on dog. I highly recommend this product. Excellent product , honestly I did not spect nothing less than perfection, that’s how I rate Ezydog products!! Excellent product. XS fits my 6 pound puppy and should expand to easily fit when he's full grown. That's compared to the Sleepypod, which is slightly too large for my 15 pound adult. Strap management is ingenious. No loose ends flopping around even with the puppy. The one clasp closure is convenient though not as simple to connect as the traditional one-clicks. I think it will perform better in a crash, however, making this at most a minor annoyance. We have had this harness for about a month now and LOVE the Harness! The build quality is great, it was easy to fit our Chow Chow puppy and has enough adjustability that she won't out grow it! Its very easy to put on and take off, the magnetic closure is very convenient. Its very secure, that even an escape artist can't get out of it. its a great piece of mind to know that our dog is secure and safe while in the car with us! 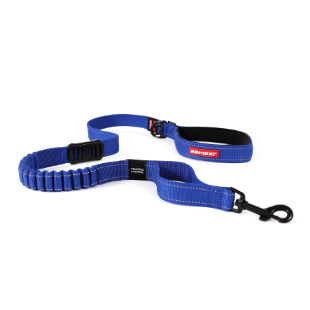 This harness is very well made and should last the lifetime of the dog if not longer. I'm sure it would work perfectly to keep a dog safe in the event of an accident. I would give the harness 5 stars but it rubs on the inside front legs of my dog and has caused sores. Not sure if this is because she is a dog with a large chest (staffardshire terrier) but I find this upsetting and it doesn't make me want to use it. The harness is well built and of quality. We still have yet to get it adjusted so that the dog can't get her mouth at it. Every time she moves, it needs to be tighter in one spot or loosened up in another. I'm not giving up just yet. I do wish it had an option to attach somehow without having the dog on the seat of the vehicle. Our dogs are not allowed on furniture and that includes the seats of the truck. We fold the seats up and now are unable to use the harness as designed. Could not adjust it for my corgi. Front panel too wide for her and she keeps backing out of it. 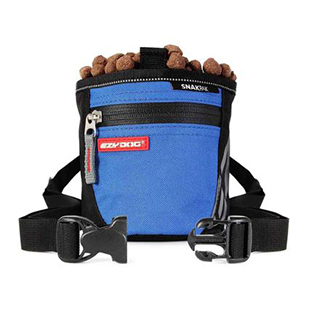 I spent several hours looking at the various harnesses that are available, and this one seemed right for our dog. Turns out that it is VERY well made, and adjusts exactly to our Shepherd. He’s not so happy that he cannot stand on the center console of the car, but it’s obvious that it’s much safer. Being retired from law enforcement, I’ve done 2 traffic accident investigations where a dog was killed in the wreck because it was thrown against the front window or the dash. This is much safer for our dog, and us. I drive an jeep and have always been concerned for my dog because it is a soft top and if we were hit and it rolled would he be ok? Well, with this car harness I have no worries. I love the way it fits, the ease of putting in on and taking it off. How easy it is to put my dog into the car and feel that he is safe and secure. Thank you!